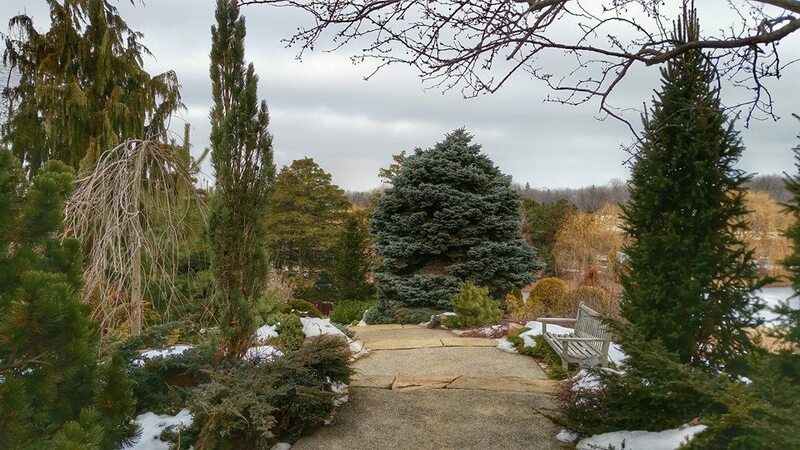 It may be 5 degrees Fahrenheit outside right now, but that’s not stopping the Dwarf Conifer Garden from shining. In fact, many of the conifers are at their peak during the coldest weather. 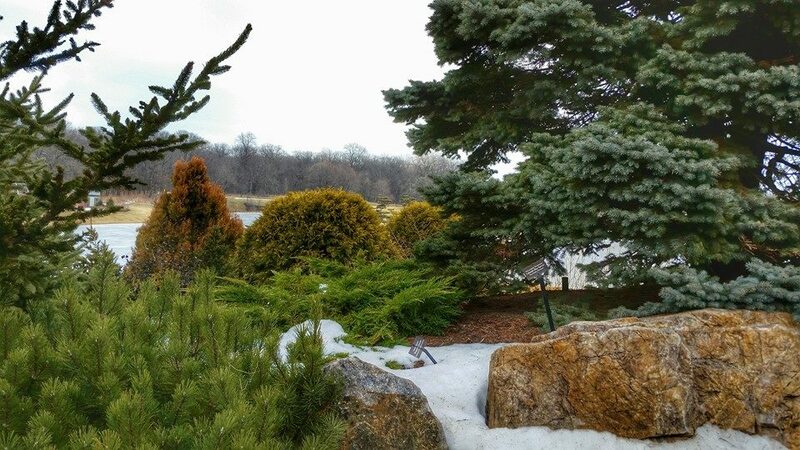 While other plants have gone dormant for the winter, various conifers are lighting up the landscape in shades of blue, yellow, bronze, plum, and more. Platycladus orientalis ‘Elegantisima’ and Thuja occidentalis ‘Golden Globe’ provide a burst of color with Picea pungens ‘Montgomery’ and other evergreens providing a calming backdrop. Arborvitae (Thuja sp.) 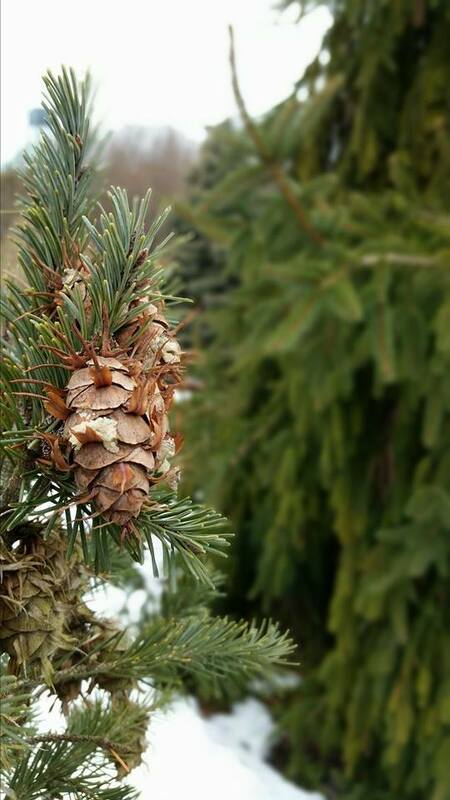 are among the best evergreens for bright winter color. 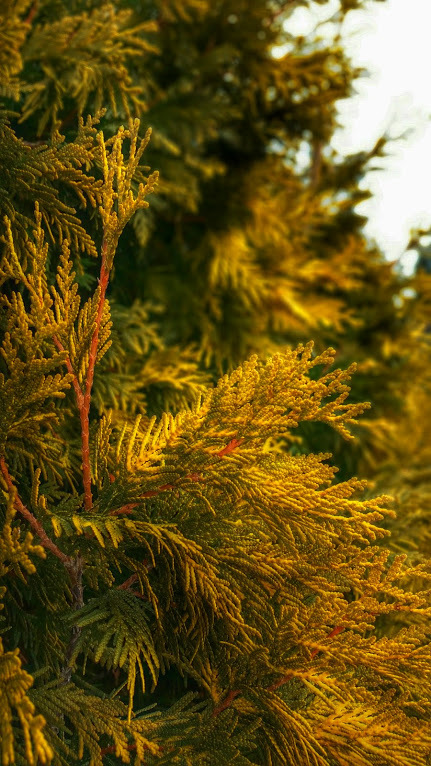 Cultivars such as Thuja occidentalis ‘Golden Globe’ provide a burst of gold while other varieties turn shades of bronze or deep green. Pines (Pinus sp.) 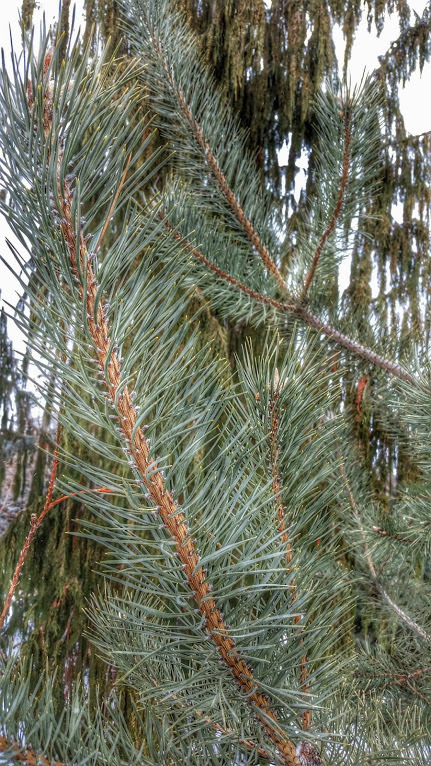 also provide a winter show with species such as Pinus sosnowskyi and Pinus sylvestris showcasing powder blue needles and beautiful brown bark. Others, such as Pinus virginiana ‘Wate’s Golden’ turn to a soft yellow hue that lights up the garden. The yellow foliage of this Thuja occidentalis ‘Yellow Ribbons’ brightens up dreary winter days. Among my favorite evergreens for winter interest are the firs (Abies sp.). Korean fir (Abies koreana) has needles that curl upward tightly, showing off silvery undersides and giving the plant a clean, tidy appearance. They also grow into a classic pyramid shape with little to no pruning, making them great for low-maintenance settings. Other firs have long, upturned needles that catch large amounts of snow. Some are the most clean, bright, silvery blue, and others have beautifully deep green foliage all winter long. The soft blue of this Picea glauca ‘Pendula’ brings out the glowing yellow tones of Thuja occidentalis ‘Yellow Ribbons’. Douglas fir have cones with interesting wings at the tip of each scale, such as those seen on this dwarf selection, Pseudotsuga menziesii ‘Fletcheri’. Other groups of conifers such as larch (Larix sp. ), Douglas fir (Pseudotsuga sp. ), yews (Taxus sp. ), and more each have their own unique growth habits that provide valuable winter texture and create strong focal points. Some of them (such as larch), lose their needles for the winter, leaving you with skeletons of copper-colored branches, while others (such as Douglas fir), are laden with unique cones. Still others (such as yews), that spent all summer providing a nice green backdrop are suddenly a sturdy focal point where your eyes can rest as you view the landscape. Contrasting textures and shapes keep the garden interesting even when snow is minimal. Fresh snow highlights the different textures found throughout the garden. 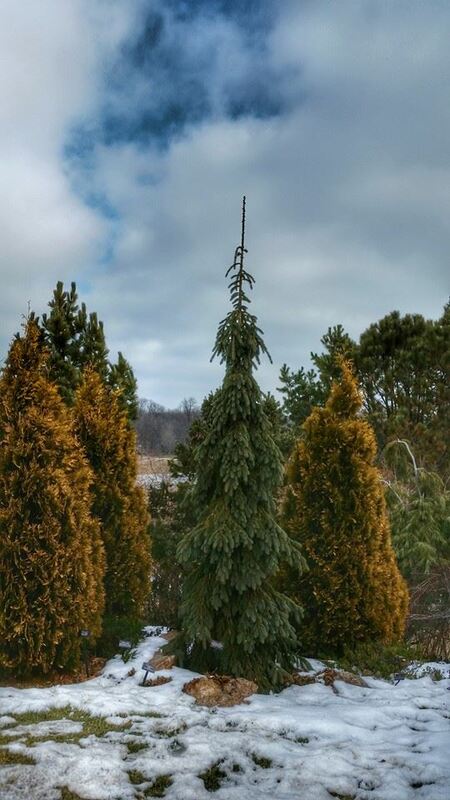 The Dwarf Conifer Garden is full of dozens of varieties and species of conifers in all shapes and sizes. 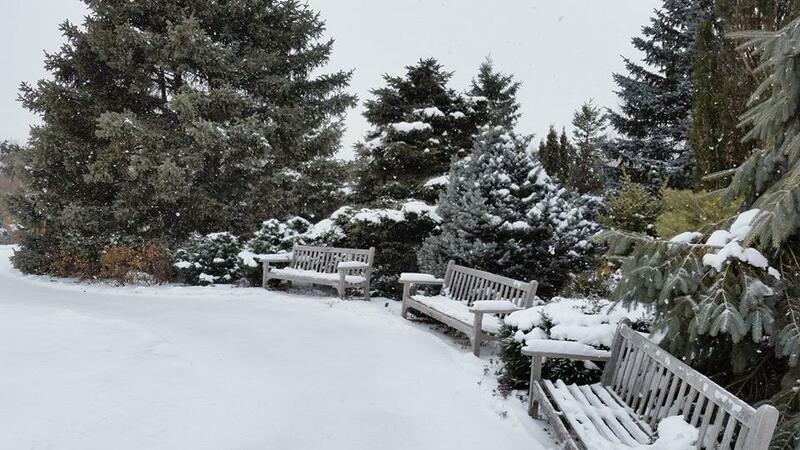 While the rest of the Chicago Botanic Garden slumbers under a thick layer of snow, this one is at its peak, waiting to show off shapes and colors that almost don’t seem real.